9" H x 5" Dia. x 2½" Base Dia. 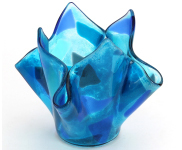 The Terrena will make your fused glass have a 2.5 inch base which is perfect for attaching to a light fixture!